This site is not associated with any ski area. Use of this page means you accept the SkiMyBest Site Use Agreement or EXIT NOW. Toni Sailer, winner of 7 World Championships, likened his racing to throwing a stone: "The stone flies by itself and it lands by itself. I get the prize because the stone flew well. Why did it fly well? Because I threw it the right way." --Ski, February 2008, page 27. Gates are thin poles or squat stubs set on ski slopes through which skiers pass (if set in pairs) or turn around (if set singly) They are used to produce standard routes or courses for skiers to practice consistent turns, isolating some of the variables of a ski slope. "Turn here, Now!" the gate requires, a discipline that is important for skiers to acquire rather than shopping the slope for a better place to turn, which may not be found and at least will interrupt the rhythm of the skiing. Of course, gates are also used for racing, with elapsed times down the course being recorded and compared for the racers. Skiers should be at level 6 (parallel skiing) to fully enjoy running gates or racing, but they can start at almost any skill level if the gates are set for that level. Gates are set down a ski hill in various configurations to produce different kinds of turns and challenges. Sometimes they are closely spaced; other times far apart so that it is not readily apparent that they describe a linked set. In either case, gates are set by a trained person so the desired skier turns are required. And as each skier passes down the course, the track is grooved into a developing rut. The more skiers, the deeper and rougher the rut becomes. Thus the course is not available to those who are not part of the invited group. If in doubt about an invitation, find the course setter and ask whether the course may be run. Persons running gates are focused on their task and to do it well they cannot be distracted by slope traffic. Often the ski hill where the gates are placed is closed to the public, with signs stating that. To ski into such an area, or even near a course that is not closed off, risks a collision with a racer or training skier who does not expect you to be there. And, one never crosses the line of a ski course without at least first checking upslope to be sure the path is clear, and sometimes it is necessary to ask permission to cross and then wait until it is granted, if it can be.. "O.K., so running gates is good for skiing. But why race through them? ", many skiers ask. They demur they are not competitive. Many of those who so state do not know themselves well. It often happens that once a skier runs a course and gets a timed result, the fires light and the course is run again and again, with requests for coaching to run it faster and beat ...(whomever). Many ski areas provide posted areas where gates can be run and times obtained, often for a fee. 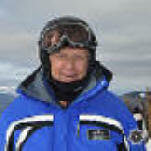 Many ski areas provide courses set daily with automatic timers. Usually there is a small charge by the resort to run these, but some allow ski school patrons to race free. There are also National Standard Races or NASTAR (www.NASTAR.com) in which a skier can get a time on a course that is calibrated daily against top skiers in the country. Here's how this works: After the course is set, a top local racer at the skier ru ns the course and gets a time. 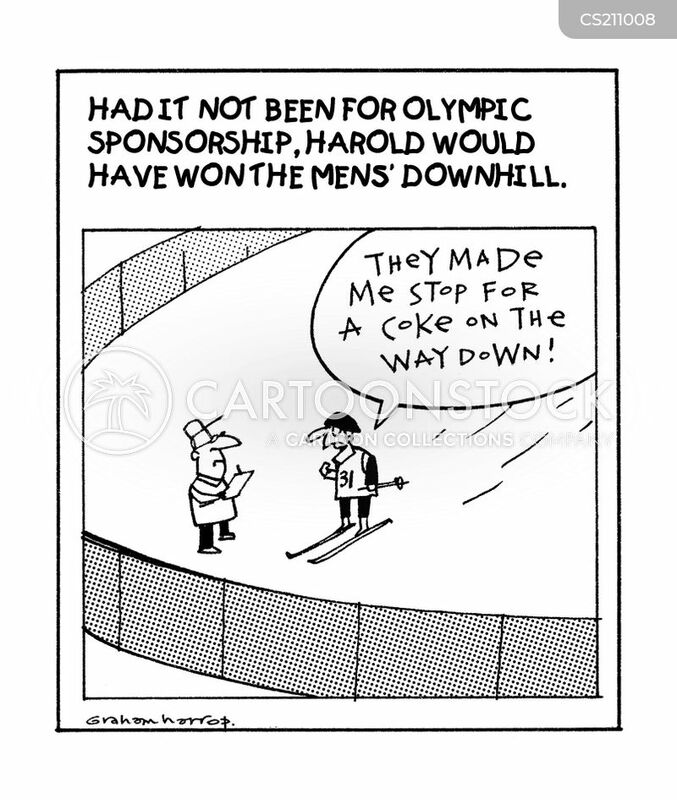 That skier is already ranked against the best by an elaborate point system. Then when your time is recorded it is compared against the time of the top local racer, and therefore the best in the country. Standards are set for percentages within the top local racer's time, by gender and with handicaps for age; and medals given out for bronze, silver, gold, and platinum. 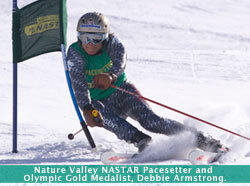 The best citizen racers are then invited to ski in national championships. See NASTAR Handicap Charts for standards for medals. For Vail Resorts (ski areas of Beaver Creek, Breckenridge, Heavenly Valley, Keystone, Kirkwood, Northstar, and Vail) there is a racing program tied in to the Epic Mix program. (http://www.epicmix.com/Activity/Vail.aspx). Because race courses are often set on hard snow areas, also see Skiing Hard Snow/Ice. But during snowy times, race courses may be softer, too, and then a soft touch is necessary to avoid pressing into the snow, causing more friction and a loss of speed. Take a look at the multiple-position photos of Olympian Phil Mahre and notice the last image, in mid-turn, the inside ski carrying the skier's weight and the outside ski off the snow. 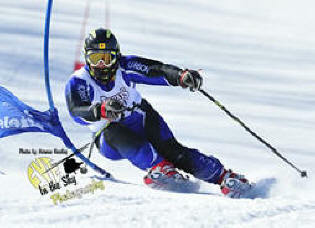 This is one specialized turn used in ski racing. In what situation would this turn be used, and what would it do? 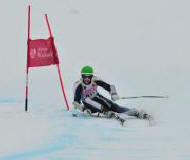 Slalom racer Scott Cooper of Middlebury College ski race team, showing mainly parallel leg shafts with open stance, angulation at outside knee and hip, arms at the ready. This "Skiing Gates/Racing" page last modified 11/03/2017 07:21:40 AM. Did you come here from a link on another website? For latest version of this page, copy to your browser: http://www.skimybest.com/skigates.htm. Copyright © 2013, 2014, 2015, 2016, 2017, 2018, 2019. William R Jones.